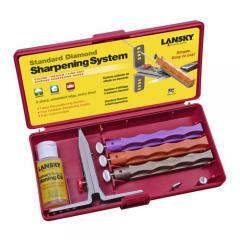 Take the guesswork out of knife sharpening with the 3-Stone Standard Diamond Knife Sharpener System from Lansky. Designed to be an all-in-one sharpening system, the kit is the perfect solution for every knife owner. The patented, multi-angle knife clamp features four angle settings to deliver the perfect edge for any application. The steel guides provide a consistent grinding angle to deliver a perfectly uniform blade edge regardless of experience or skill. Three diamond hones offer the varied grit needed to recondition, touch-up and fine-tune any blade. Each hone is housed in an ergonomically designed case for safe and secure handling. The specially formulated honing oil ensures a smooth, even stroke every time. All contents are secured in a custom-molded carrying case for convenient storage and transport.